The League of Women Voters of Portland Education Fund is a 501(c)(3) nonprofit nonpartisan educational organization. Education Fund volunteers produce educational programs and publish educational materials to help voters understand election issues and to help the people of Multnomah County understand governmental issues that affect their lives. The LWVPDX Education Fund is governed by a Board of Trustees that approves its budget. Because the budgets of both organizations are related, the Education Fund budget is presented to the members for their comments, recommendations and questions. Funding approved in the combined Education Fund and Regular Fund budgets will support LWVPDX activities in the next fiscal year. The LWV of Portland and the LWV of Portland Education Fund maintain an office and employ one part-time office manager. The LWV of Portland is part of the League of Women Voters of Oregon (LWVOR) and the League of Women Voters of the United States (LWVUS). 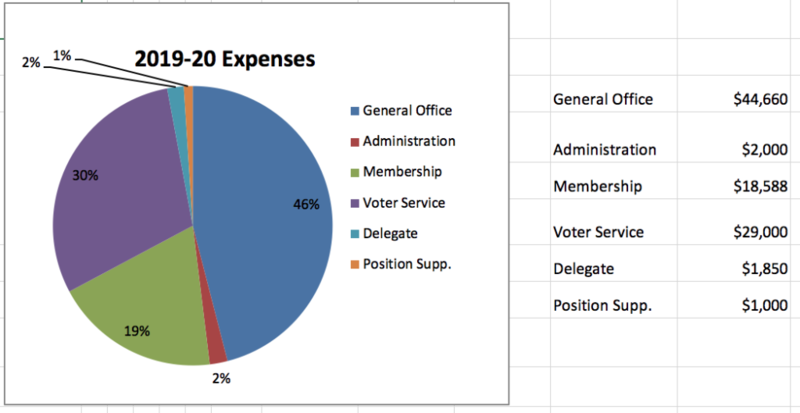 Major expenses in the budget are for rent, for salary, and for payments to the LWVOR and the LWVUS for the League’s statewide and national advocacy and educational programs. Other large expenses are for printing, video recording and publicity for the League’s educational services. Most of the work of the League is accomplished by volunteers. This reduces the cost of administration and of providing the League’s services to members and to the public. The total proposed 2019-20 budget for the League of Women Voters of Portland is $43,339; the total proposed budget for the LWVPDX Education Fund is $53,759. The combined total budget is $97,098. The Budget Committee presents to the League of Women Voters of Portland the proposed budgets for fiscal year 2019-20. Members may discuss, debate, and amend the budget for the Regular Fund at the annual meeting (the local convention on May 13). The Education Fund budget is provided for review and comment only, because it is related to the Regular Fund budget; the Education Fund budget will be adopted by the trustees at a meeting after the Convention. The worksheets for the League’s estimated 2019-2020 expenses may be viewed by clicking here. The worksheet for the League’s estimated 2019-2020 revenue may be viewed by clicking here. The overall budget is about $4,000 higher than the previous year’s budget, partly due to increases in rent and staff salary. We have also designated $3,000 to cover unexpected expenses and the potential costs of finding and relocating to a new League office before the current lease expires in July 2020. Significant resources are provided to support voter service and outreach activities for the 2020 primary election. We have also designated funds for events to celebrate the LWV’s 100th anniversary next year. The graph and table below show the total expenses for the combined Regular Fund and Education Fund budgets. The expenses included under General Office are rent, salary, supplies, communications, equipment, fees, insurance and moving expenses. Administration covers the expenses of board members and officers, who work as volunteers. Membership includes payments to LWVOR and LWVUS, and services for LWVPDX members. Voter Service is the cost of providing educational programs and materials. The Delegate expense supports sending our members to state and national conventions. Position Support is for expenses to advocate for or against ballot measures and other policies on which we have advocacy positions. As approved in the 2018-19 Budget, half of the dues income will be attributed to the Education Fund. The change partly reflects our ability to pay LWVOR PMP (per member payments) with Education Fund income. Some additional expenses have also been assigned to the Education Fund, since we believe a greater portion of our activities are either community or member education. In 2016 the Portland League voted to increase member dues yearly by $1, plus any increase in PMP approved by the LWVUS or the LWVOR (none identified at this point). Proposed dues will therefore be $79 (or $118.50 for household memberships) for FY 2019-20. We currently send $32 to LWVUS and $30.50 to LWVOR for each member to support League activities at the national and state level. Only $16.50 of the annual dues remains to support Portland activities. 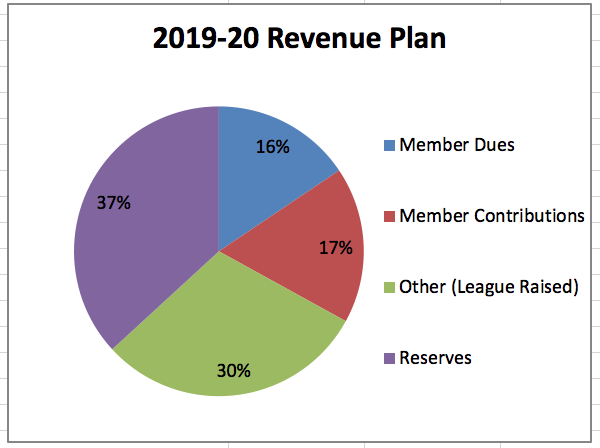 A major part of the revenue comes from funding that the League’s Development Committee raises: contributions from members, as well as donations from nonmembers and businesses, and grants from foundations. When more funding is needed than can be raised, it may be withdrawn from reserve funds. The graph and table below show the revenue plan for the combined Regular Fund and Education Fund budgets. Job Description. The Budget Committee is appointed by the Board and meets typically between January and March to formulate a proposed budget for the next fiscal year. Budget Committee: Betsy Pratt (Chair), Peter Englander, Anne Davidson, Geoff Gilbert, and Maud Naroll.